A photo arrived a few weeks back from a friend attending a Chicago Blackhawks game. He was happily sharing the state of the beer menu at the United Center, home to the city’s hockey and basketball teams and a major concert venue. Indeed, it was an admirable list. 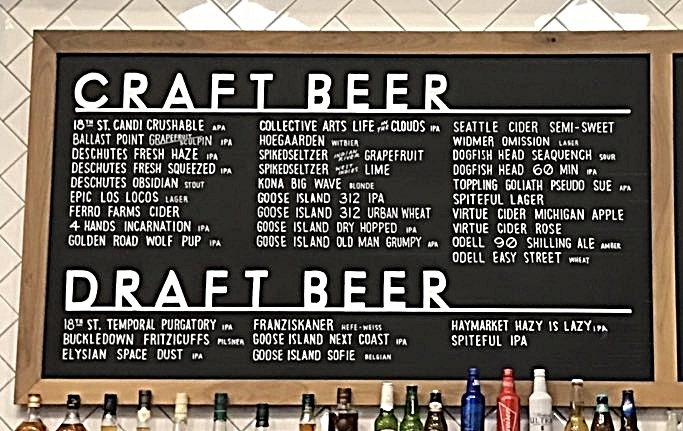 “Illusion of choice” is a phenomenon sparked by the world’s largest beer companies buying their way into craft beer, amounting to what seems like a vast array of beer options in fact leading back to a single company. That company, of course, tends the biggest beer company of them all: Anheuser-Busch InBev. A mere eight years ago, as craft beer was becoming ascendant in the United States, Anheuser-Busch InBev made no credible craft beer. (No, Shock Top and Michelob Winter’s Bourbon Cask Ale didn’t count — which was the problem.) So, as explained in “Barrel-Aged Stout and Selling Out,” Anheuser-Busch InBev did what multibillion dollar companies do when dominance is threatened by scrappy upstarts. It buys the scrappy upstarts. Between 2011 and 2017, Anheuser-Busch InBev spent hundreds of millions of dollars acquiring 10 American craft breweries. The result? Within a mere seven years, Anheuser-Busch InBev has gone from craft beer irrelevance to the nation’s dominant craft beer manufacturer. The other result? “Illusion of choice,” say the critics (most commonly, craft beer trade group the Brewers Association). Thanks to its shopping spree, Anheuser-Busch distributors are able to offer a slew of beer brands that appear to the average customer to come from a variety of sources, but in fact trace back to that one company. In many cases the beer even leads back to the very same brewing equipment. Is “illusion of choice” real? On one hand, no — choice is the very thing Anheuser-Busch InBev bought. The largest beer company in the world has acquired a portfolio of 10 breweries with their own distinct stories, perspectives and approaches to innovation. Those breweries are rooted in different regions of the country and specialize in brewing different styles. Being able to offer an IPA from Seattle, a lager from Central Virginia and a stout aged in bourbon barrels from Chicago — in other words, choice — was the entire point of the exercise. On the other hand: of course it’s real. When staring at a draft list that includes Anheuser-Busch InBev acquisitions Goose Island, Elysian, Golden Road, Blue Point and Wicked Weed, consumers aren’t choosing from a variety of companies. They’re choosing from Anheuser-Busch InBev. “Illusion of choice” comes in many forms. It can be a beer festival where you'd never know that 41 percent of the beer traces back to a single company. It can be signage at a bar in downtown Denver, across the street from the Great American Beer Festival, which just so happens to tout nothing but Anheuser-Busch InBev acquisitions (with no acknowledgment of the common ownership, of course). Or it can be a wall of windows at that same bar that features four of the same Anheuser-Busch InBev acquisitions featured above, plus two more (again, with no acknowledgment of the common ownership). But most often, “illusion of choice” doesn’t happen at beer festivals or as signage outside a bar. It comes where it counts: on store shelves and on beer menus, at the places people open their wallets. Critics like to key in on the places where Anheuser-Busch InBev and its nationwide army of distributors have the tightest grip on the taps, and are able to exert the most control — such as an airport bar, where all eight taps might pour Anheuser-Busch InBev products. While that most likely happens, it’s the exception. More common is what we see in that photo from the Blackhawks game. That United Center beer list is at first glance an example of fairly healthy diversity and consumer choice. But squint and you see that one company is disproportionally represented. Yup — Anheuser-Busch InBev. Nearly half the beers — 16 of 36, which maps out to 44 percent — are Anheuser-Busch InBev products. 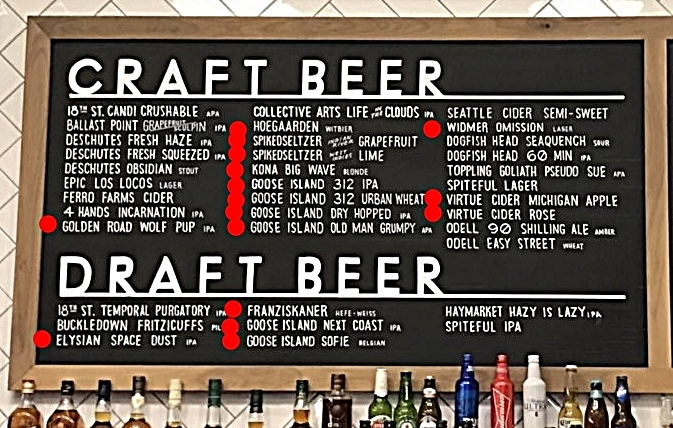 The red dots indicate the beers owned by Anheuser-Busch (two of which, Kona and Widmer, are minority stakes for the company, though it’s quite likely they’ll be wholly owned soon enough.) At least seven of the products are even made by Anheuser-Busch itself. Not only is Anheuser-Busch InBev disproportionally represented on the beer menu, it has also built dominance on the hard seltzer and cider fronts. That’s the exact reason it bought SpikedSeltzer in 2016 and Virtue Cider in 2015 — the company needed a hard seltzer and craft cider to absorb as much real estate as it could on shelves and beer menus. At the United Center, it’s working. To be sure, Anheuser-Busch is not alone in trading on illusion. MillerCoors’ Blue Moon is the most successful craft beer in the United States and the company deserves credit for innovating and nurturing that brand. But the “Blue Moon Brewing Company” — which is even the brand’s URL — is largely a myth. The beer is made by MillerCoors in Golden, Colo., Elkton, Va. and Milwaukee, alongside Miller Lite, Coors Light and Keystone Light. To the company’s credit, that reality is made clear when digging deeply enough into the MillerCoors website. Meanwhile we’re still awaiting such clarity from Anheuser-Busch. (The Baldwinsvlle, N.Y. brewery that makes most of Goose Island’s volume simply “produces more than 65 products ... In addition to the company’s flagship brands, Budweiser and Bud Light.”) Clarity is not Anheuser-Busch InBev’s forte — dominance is. Such an approach doesn’t solve all issues of transparency. But it’s a start. If Madison Square Garden, in addition to other arenas, bars and restaurants, were to employ that practice with Anheuser-Busch’s entire craft portfolio (as well as MillerCoors and Blue Moon), it would be a game changer of sorts. It would be the exact information customers need to make an informed shopping decision at the place they need it most: the place where they’re shopping.